Parents have the legal right to request all documents from their child’s school and the school district. Schools and school districts can transfer records to your child’s new school. But to follow up with teachers and new school administrators, it can save a lot of time to simply have the files and records they need. 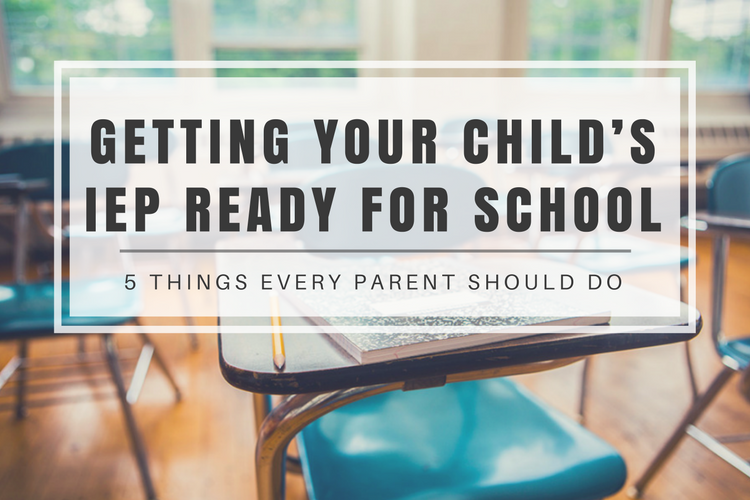 Even if your child stays within the school district, having copies of the most updated IEP, any current accommodations, and progress reports make the transition that much smoother. Teachers and administrators are swamped with parents scheduling meetings. And the first months of school are usually the busiest meeting-heavy months for teachers. So, the earlier in the year you can schedule an appointment the better. To start IEP implementation, most schools schedule meetings with teachers, parents, and administration. These meetings happen in the spring or toward the end of the school year. But you can request they schedule a meeting at any time. Even if the teachers were present at the IEP meetings last year, you should connect with them again before school begins. Just a quick sit-down meeting where you review the IEP with the teacher can be a great refresher. Parents have to notify the new school of a child’s IEP and to request a meeting. It can be helpful to have your child’s previous special education teacher to attend any IEP meetings. So, at enrollment, request a meeting with the school’s special education staff to put in place IEP requirements. This is a great way to make sure everyone is on the same page. If your child is transferring to a school in another state, most schools provide comparable services. The school will most likely want to conduct their own IEP evaluation. The laws and requirements for students and school differ a great deal between states. Until the school provides their own IEP, families should expect the previous IEP to remain in place in the meantime. You need to make sure your child’s new school sent a “records transfer request” to your child’s previous school. Be sure to ask for the date that the records request was sent, and ask for the date when the records themselves were sent. The records transfer must include the IEP and all other records necessary to provide special education or related services to your child. Make sure the records transfer is complete, especially if they have not processed it after two weeks. Most schools require testing from either the school psychologist, special education staff, or an outside party. The vast majority of evaluations we provide are for IEPs and learning accommodations. We offer an in-depth and comprehensive evaluation for your child that will set them up for success for the new school year. Our evaluations provide the required clinical diagnoses and recommendations for learning accommodations. Also, we can offer objective, strengths-based testing that can provide a clear path forward. One of the most common requirements for your child to go through some kind of testing or evaluation. Most schools require testing from either the school psychologist, special education staff, or an outside party. The vast majority of evaluations we provide are for IEPs and learning accommodations. We are able to provide so much more than the required testing. We offer an in-depth and comprehensive evaluation for your child that will set them up for success for the new school year. Our evaluations provide the required clinical diagnoses and recommendations for learning accommodations. Also, we can offer objective, strengths-based testing that can provide a clear path forward.